As Happy Foundation Archives Director Gene Elder once pointed out, “an archive can be as simple as a shoebox in the closet.” And while his cavernous headquarters at the Bonham Exchange are in fact brimming with what appears to be thousands of these DIY shoebox-archives — not to mention bankers boxes and files dedicated to practically every local or national LGBTQ figure one can imagine — there are also more fully realized windows into the past. Meticulously organized and weighing in at 384 pages, one such example is a stuffed three-ring binder created by the late Wade A. Strauch Jr., a pretty young thing who was very close to entrepreneur and Bonham Exchange founder Arthur “Hap” Veltman (for whom the Happy Foundation is named). 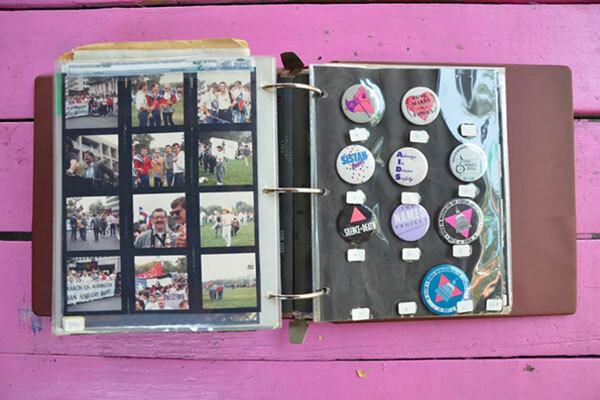 Originally presented to San Antonio College professor Karen Jones Connelly for a course Strauch took in the fall of 1987, the binder chronicles every imaginable aspect of that year’s landmark National March on Washington for Gay and Lesbian Rights. Divided into 10 chapters — Schedule, March Handbook, The Wedding, The Quilt, The Civil Disobedience Protest, Handouts, Congressional Lobbying, Magazine Articles, Newspaper Articles, and Pins and Photographs — the project looks and reads like a time capsule — one that evidences major progress but also reminds that certain battles are still being fought. An end to discrimination against people with AIDS, A.R.C., HIV positive status, or those perceived to have AIDS. 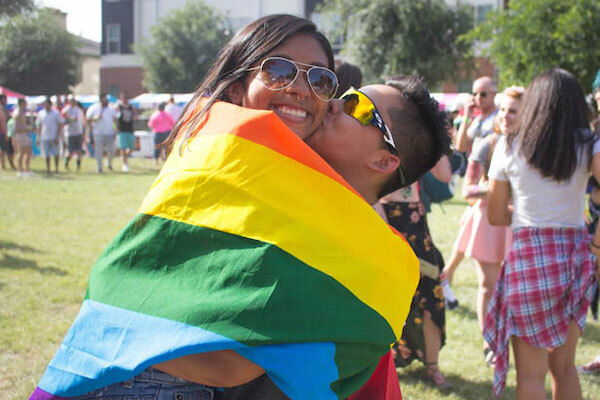 Massive increases in funding for AIDS education, research and patient care. Money for AIDS not for war. Reproductive freedom, the right to control our own bodies and an end to sexist oppression. An end to racism in this country, and apartheid in South Africa. Easily the binder’s most captivating pages display contact sheets of rolls of medium format film Veltman shot on his Hasselblad. In addition to proving the late San Antonio icon had a good eye, the images place several familiar faces (including Elder, Strauch, Bonham owner Kenneth Garrett and Cornyation ringleader Ray Chavez all looking adorable in ’80s-era styles) among the hundreds of thousands who made history on October 11, 1987. Tags Arthur "Hap" Veltman, Bonham Exchange, Gene Elder, Karen Jones Connelly, Kenneth Garrett, Ray Chavez, the Happy Foundation, Wade A. Strauch Jr.
Arthur "Hap" Veltman, Bonham Exchange, Gene Elder, Karen Jones Connelly, Kenneth Garrett, Ray Chavez, the Happy Foundation, Wade A. Strauch Jr.